The toy industry is continually expanding, offering up new products kids want and parents purchase, but with such an abundance of toys on the market, it’s difficult to determine which toys are actually the best both for your child’s brain and for your checkbook. Toys aren’t just for entertainment. Toys are known to improve your child’s ability to solve problems, get along with others, and improve language and motor skills. But today’s latest smart toys go a step further helping children better develop the parts of their brain that will be useful in our tech-advanced world, such as toys that help children learn to code or communicate using smart devices. Smart toys help kids better adapt to the culture and environment that they are raised to be a part of. For many children today, this means they are toys that help children better understand the use of technology and how to master it. While traditional toys are designed for entertainment alone, smart toys allow children to learn as they play. Many advocates of smart toys also cite that children learn more effectively with good interactive software. 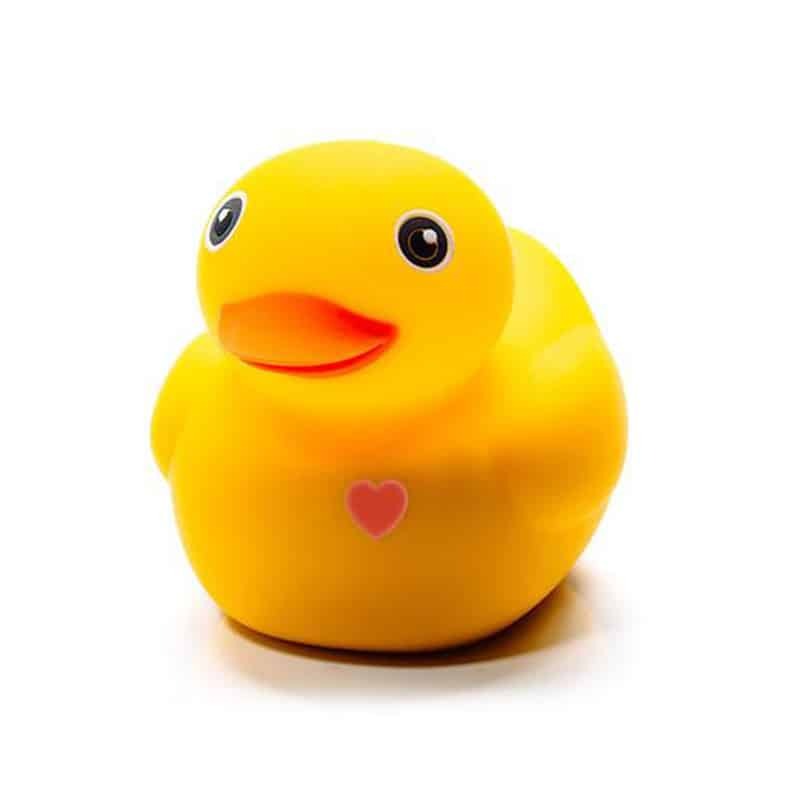 Smart toys come in all shapes and sizes, as well as for all genders and ages. 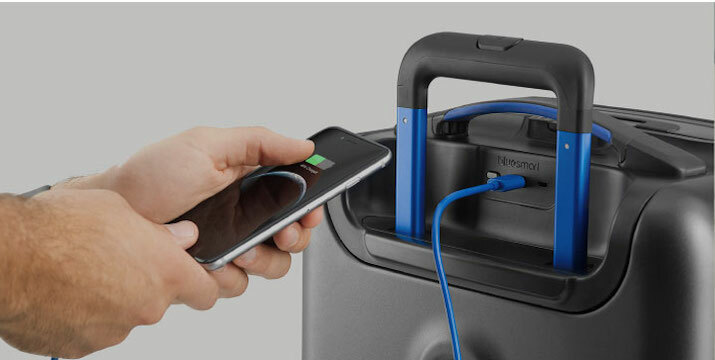 The toys vary greatly in what is required to make them work, but seeing as most come with built-in technology, you’ll likely need a way to charge any smart toy, and for some require Wi-Fi or Bluetooth along with other smart-enabled devices to sync the toys with. 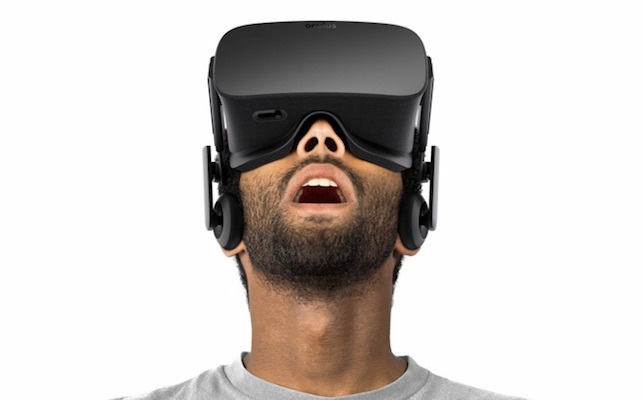 Luckily, most come with instruction manuals that make setting up the toys a seamless process. Smart toys are more advanced than generic toys, and like most products that are more advanced they typically cost more. You can find smart toys that range from the under $50 mark to over a few hundred dollars. Ready to give your child the gift of learning along with play? 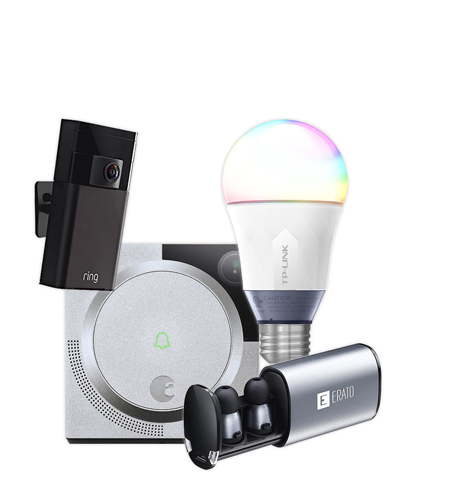 Explore these top smart toys below. Turn quiz-style learning into a fun and interactive activity allowing every child in a group to enjoy and benefit. Energize those typical, everyday activities by giving your child a way to participate through this flashing, beeping, buzzing, interactive game system. 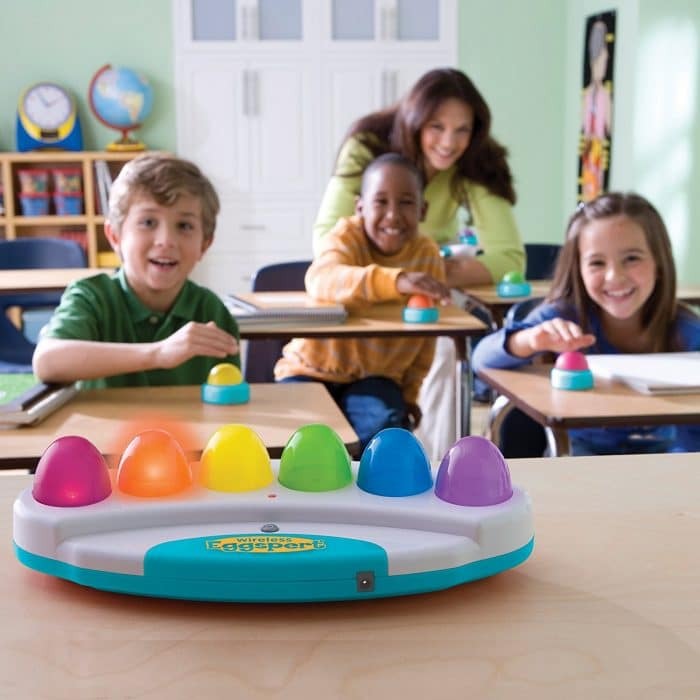 Best used in groups, the Wireless Eggspert provides an interactive quiz-game for children which can be played in two modes: “Quiz Show” mode, in which kids race to buzz in, or “Scrambled Eggs” mode during which the toy itself chooses a child participant to answer the question at random. By giving children a more interactive way to participate in group game settings, the toy better holds children’s’ attention and engages them as they play. 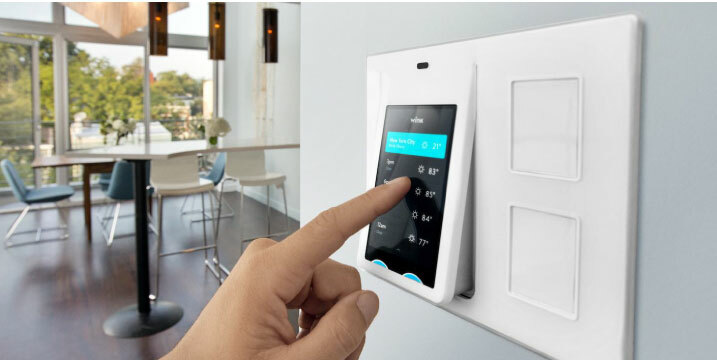 The Wireless Eggspert 2.4 allows children to play in a high energy, fast-paced environment, as the system operates on wireless speeds of 2.4Ghz. The speed and veracity aren’t just time savers, the wireless, interactive aspect of the toy encourages fast thinking, better social skills, friendly competition, and enhanced motor skills. The toy can be used to better teach nearly any topic, from trivia to math skills, and has a sliding scale to accommodate kids of all ages. The set includes the host Wireless Eggspert, 6 wireless player buttons, wireless instructor remote, and guide. 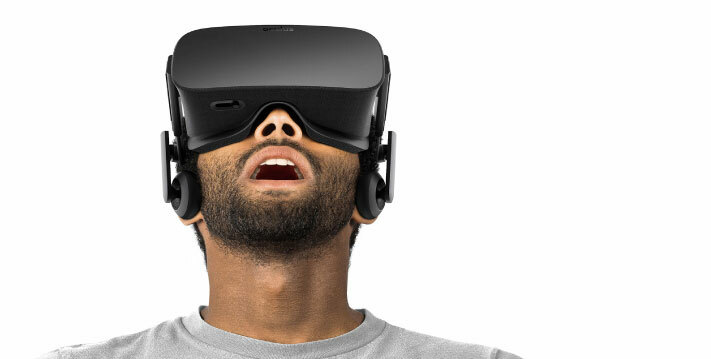 Additional play buttons are sold separately. Reviewers note that the system works as advertised and is a distinguishable element of fun to any quiz related game. Parents and instructors love that the system provides a way to get everyone involved, even those children who may be more shy or timid. 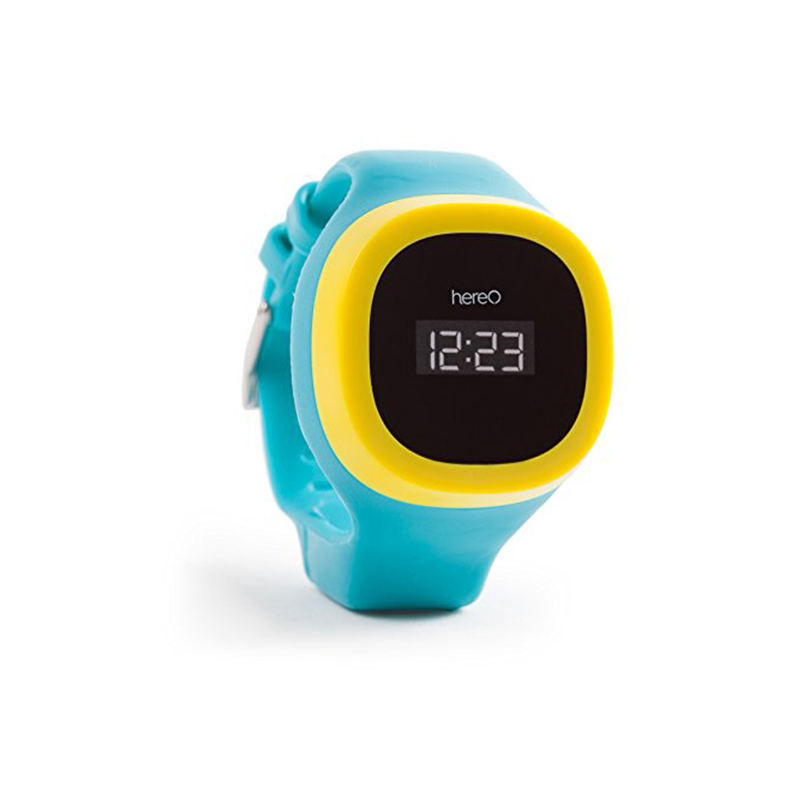 Active users of the device also appreciate the multiple options for wait times before a selected child’s “time is up”, along with an option for no time limit at all. 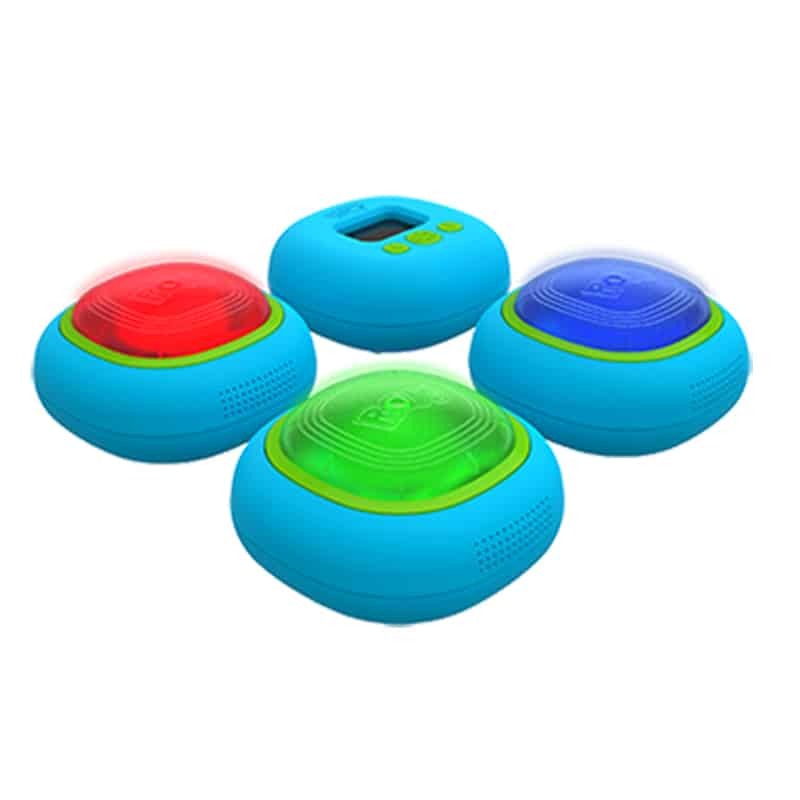 If you often babysit, teach, or entertain children in groups, the Wireless Eggspert provides a fun-filled way to get all kids involved and engaged. Likewise, if you’re looking for ways to get kids away from their video games but still improve their motor skills, this smart toy is perfect for them. 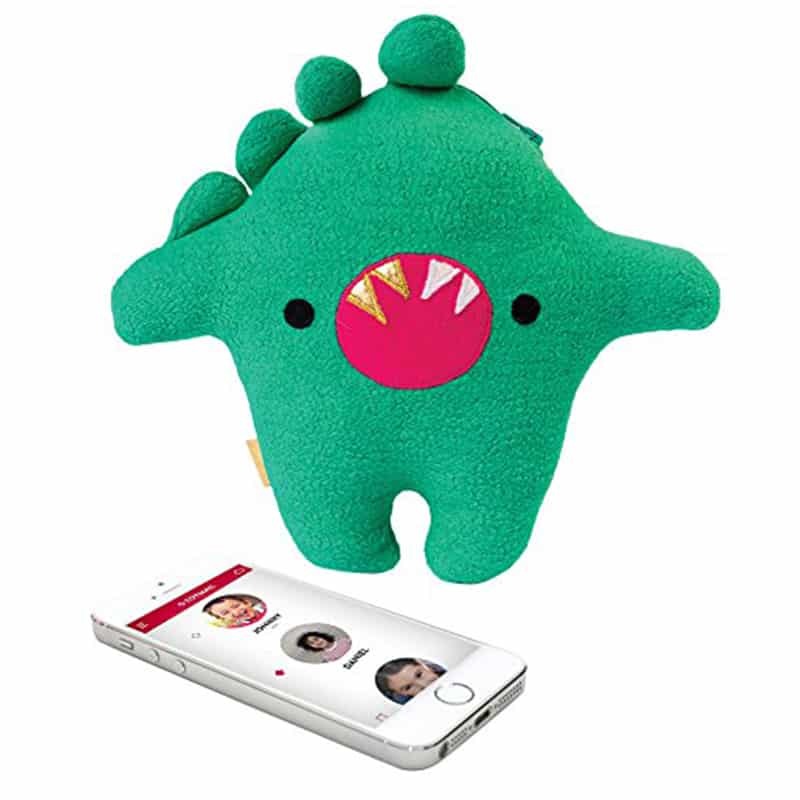 Stay closely connected with your little one through this smart synced stuff animal. Stuffed animals are toys that have been loved by children for centuries. 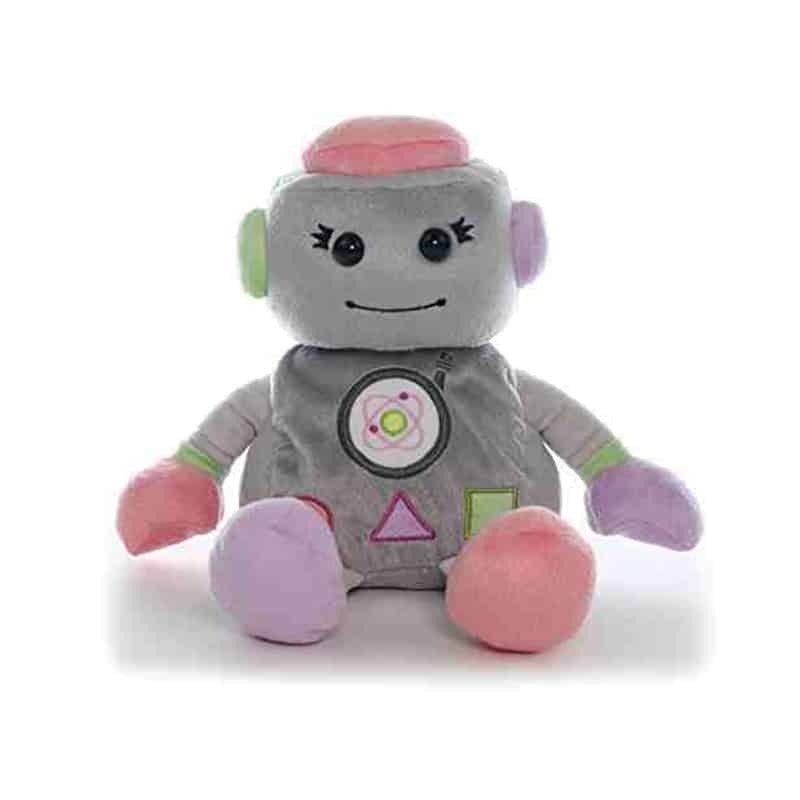 But recently these fun, snuggly toys have been upgraded to provide not only fantasy companionship, but also a way for children to learn and interact in more advanced ways. 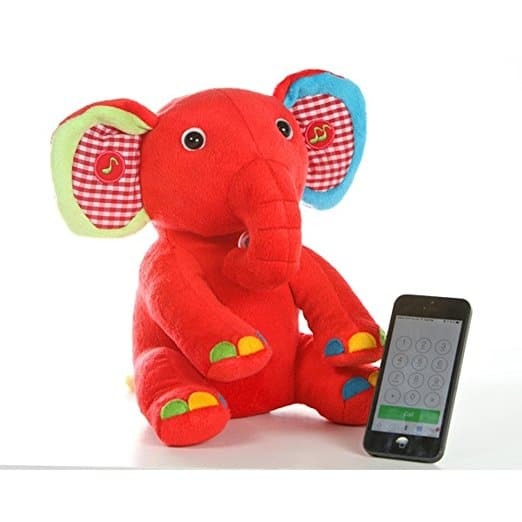 KUMKI is a Bluetooth operated stuffed animal that connect to your iPhone, iPad, Android, Win8, MP3 Player, Tablet, Laptop, Smart phone or any Bluetooth enabled device for a variety of uses. Once the stuffed animal and your device are synced, KUMKI can sing songs, play music, tell stories, and more to keep your child entertained for hours. Easily play Audio storybooks and your child’s favorite sing-alongs from Youtube, iTunes or from any Internet music source using your connected device or record songs or stories in your own voice and play it back to your child on KUMKI. By speaking to your child using the stuffed animal you can teach essential sounds and make the learning process fun and engaging. Better yet, you can sing a song, tell a good night story, or simply talk to your child by calling a phone paired with KUMKI, helping you stay in touch with your little ones from office, car or when you are away from home. 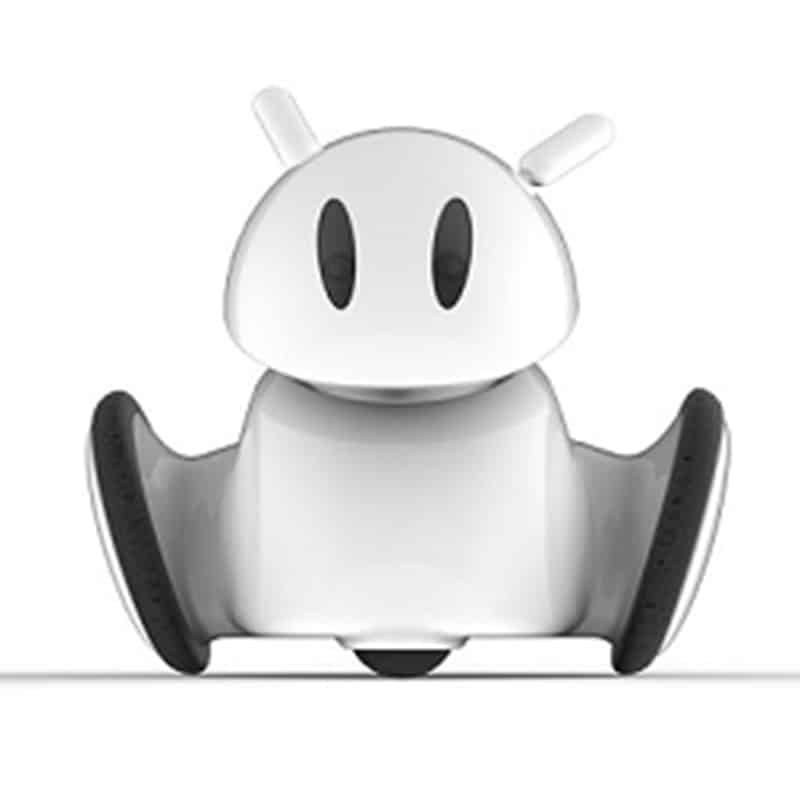 Last but not least, you can use the smart stuffed animal as a wireless portable speaker by pairing it with your music player and enjoying clear sound both indoors and outdoors. Parents love how KUMKI gets their smartphone out of their child’s hands and replaces it with something more controlled and age-appropriate. 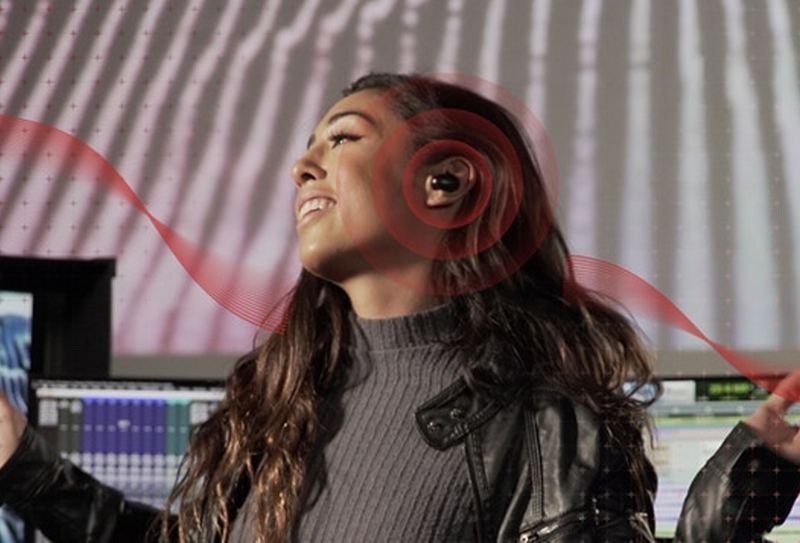 Reviewers also note how both the sound quality and syncing capabilities work better than expected. If your job or personal life keeps you away from your child more than you’d like, KUMKI provides the perfect solution, allowing your little one to hear your phone from far away. If you’ve become a parent who has given up on traditional toys and just gives your child your phone to play with to keep him or her entertained, KUMKI is a suitable alternative that provides the same entertainment benefits without any of the risks that handing your child your smartphone can entail. Give your child the best friend he didn’t know he needed with this smart robot that learns more about your child the more it’s played with. Cozmo may be the closest thing to a smart robot that we see in the movies, only it’s actually available in real life. The smart robot is able to express a range of emotions and respond to your child’s actions giving the robot an authentic feeling personality. Even more fascinating is the way Cozmo learns. The more your child plays with the device, the better the smart robot ‘learns’ your child and becomes a better (virtual) friend. Cozmo ranges in emotions from adventurous to goofy and if you leave the smart robot alone, he even picks up on this cue and becomes grumpy. Great for teaching children how to develop friendships and the value or building rapport, Cozmo also never leaves your child bored. Play with some of the built-in games, such as Quick Tap or KeepAway, or put Cozmo into “adventure” mode, in which your child can can drive it around, much like a remote control car, and see things through its point of view. Cosmo syncs with iOS and Android devices, allowing you to continually download new games for your child to play. 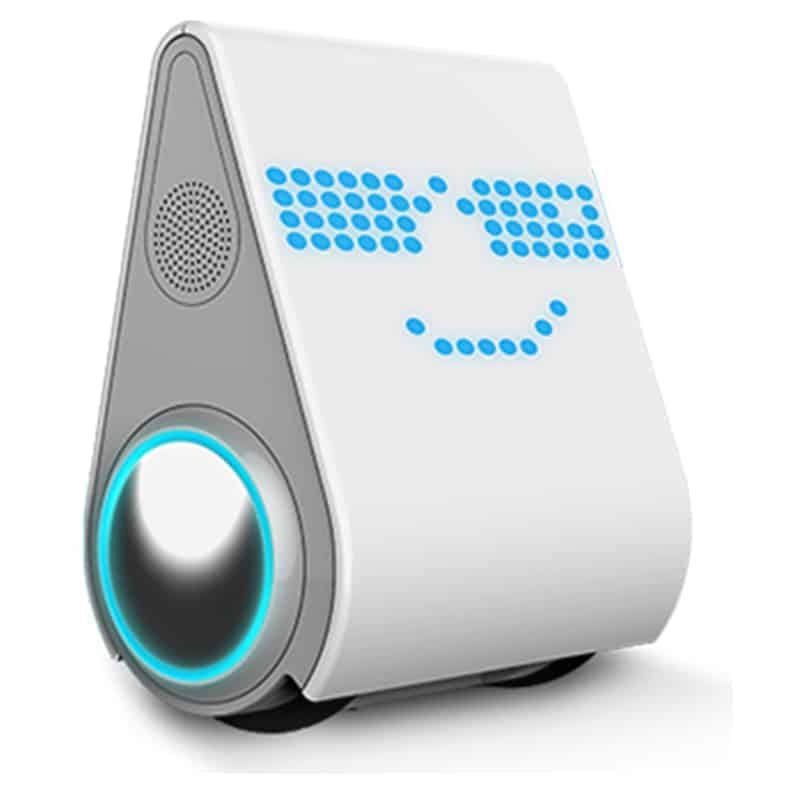 Reviewers mention that Cozmo reminds them of Disney’s Wall-E with its range of emotions and distinctive personality features. Parents also love that the toy’s learning curve is easier, allowing all of their children to play with the smart robot regardless of age. If you have an only child, Cozmo can provide some of the companionship siblings would provide, allowing your child to develop a better sense of how to share and build friendships. Cosmo is also ideal for the child that gets bored with one toy too easily and needs different types of entertainment to stay truly engaged. Give your child a smart toy that will spark his or her imagination, while it teaches coding skill from beginner to advanced. If your child has that creative itch, there’s no better way to fuel it than with a smart toy that is designed to inspire tomorrow’s inventors and innovators. 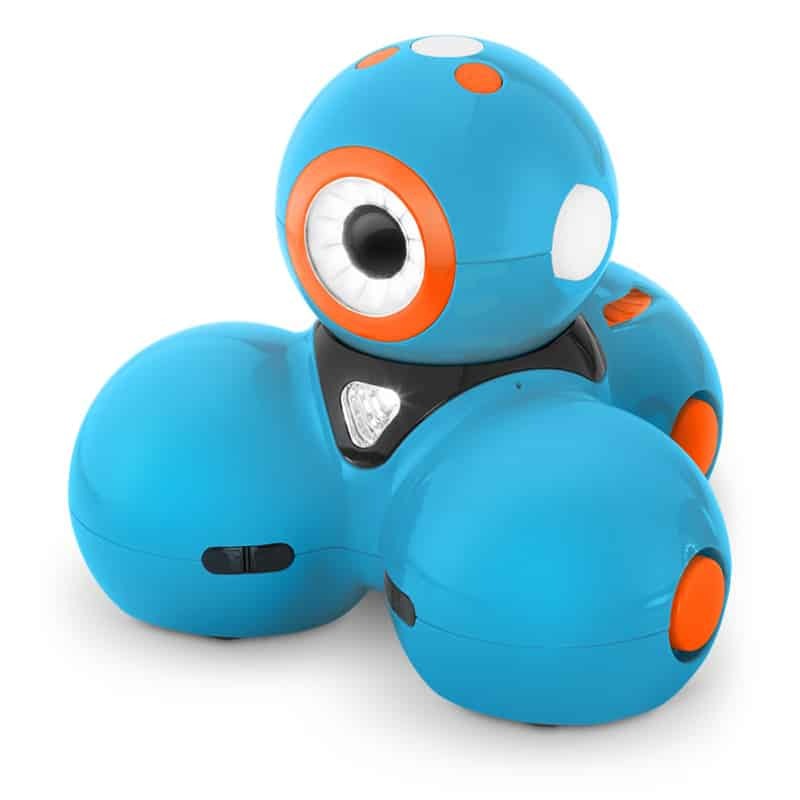 Sphero makes learning and creation fun and entertaining while teaching your child skills of the future in an approachable, practical, and fun way. The smart coding toy features a smart code viewer and visual block-based programming. You child can turn ideas into code by using visual blocks that represent the C-based language, OVAL or combine commands, see the code, and use it as a foundation to learn more about programming. Simple commands like roll, flip, spin, and display color can change and expand on to create more complex, multi-step instructions for the robot to follow. Best of all, it’s a toy that will grow with your child as it is suitable for all ages, meaning it’s approachable for beginners yet still sophisticated enough to challenge seasoned programmers. With a 5-star review average on Amazon, reviewers are raving about Spiro stating it’s a great gift for those interested in coding and really helps to develop a child’s problem-solving skills. 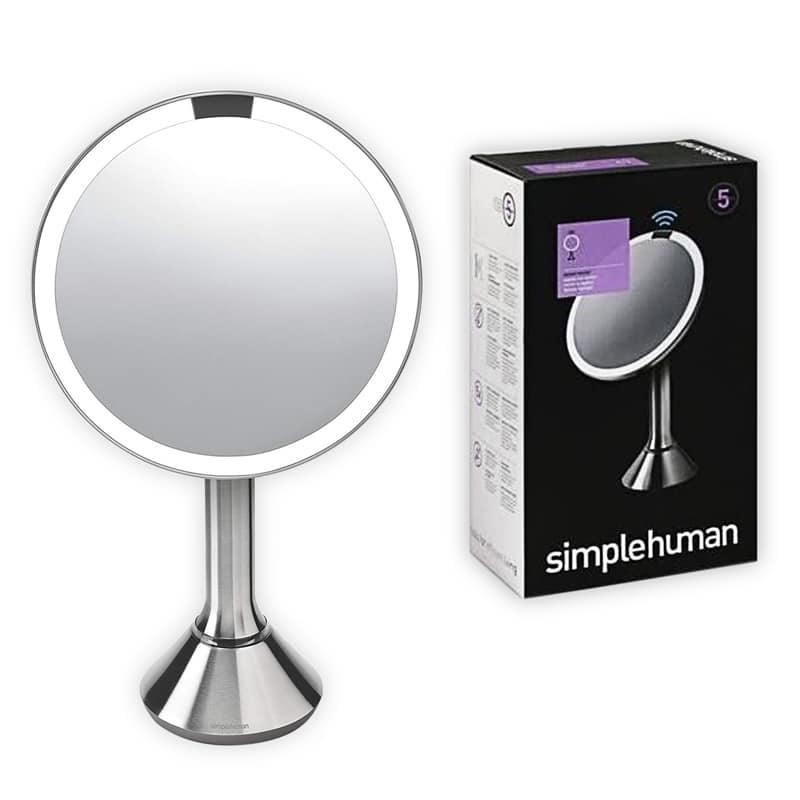 Some reviewers state that although the product page does not come with an age recommendation, it’s likely best for children 10 years of age and older. This smart toy is the perfect learning device for any child interested in programming, whether or not they have any experience in doing so. It’s also ideal for kids who get great joy out of problem solving and puzzles and want to see if programming may be of interest to them. It’s no secret that the health of our children is an imperative factor in their development, but with fast food and screen addictions, raising kids to be healthy as well as happy is more difficult than it appears. In fact, a large problem is that over half of young children are actually under-hydrated. Enter Gululu, the smart water bottle that helps your kids learn healthy hydration habits through the use of kid-friendly entertainment. 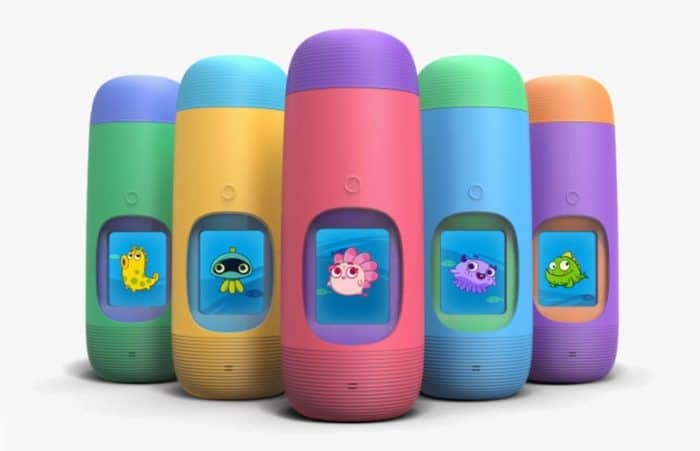 Gululu is an interactive water bottle that motivates children to live healthier and happier using an automated on-screen pet. As your child consumes water, the pet grows happier and evolves, to promote healthy drinking habits in little ones. The pets develop emotions as your child interact with them and when kids forget to hydrate, their pet feels lonely and sad to gently reminds them to drink water. Pets evolve better, just like your child, when more water is consumed. They grow and explore for treasures when your kid hydrates regularly. To make it social, two water bottles can even connect to give your child’s pet a friend. If two kids shake their bottles close together, their pets become friends, and from there the ‘friends’ can compare and compete with their water drinking habit score. Best of all, the product is cheat-proof, meaning it can detect the difference between your child drinking the water and just tossing it out of the bottle. Lastly, you can check in on the status of your child’s hydration level at any time. If your child’s health is a concern to you and you want to encourage healthy drinking habits, Gululu is an effective, fun solution. It’s also a great toy to give to children who are constantly out and about, and may usually sacrifice healthy drinking habits but just picking up whatever is available, such as soda or other sugary drinks. Adults love smart watches, but until recently we haven’t seen the industry align itself with the needs and wants of children. 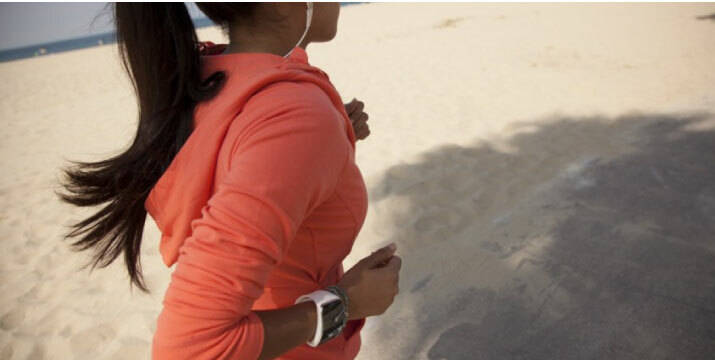 Most child smart watches simply act as GPS trackers and don’t provide the array of features and benefits adult smart watches contain. That is, of course, until the Omnate Wherecom K3 smartwatch hit the shelves. This fully-functional smart watch for kids is the first of it’s kind to use a complete Android operating system, Android Lollipop 5.1 to be exact. 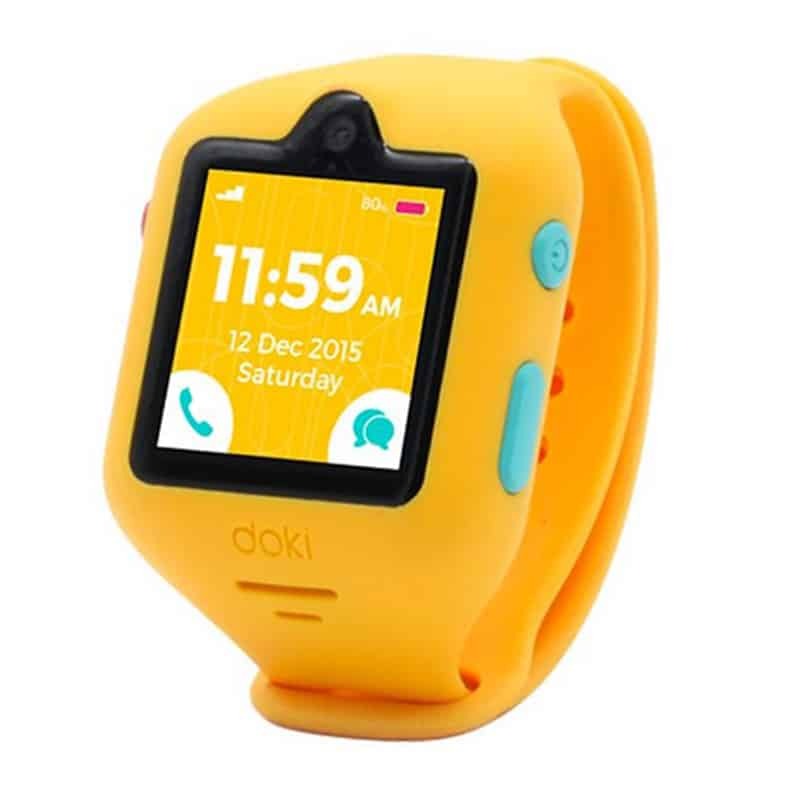 It comes packed with a GPS, Wi-Fi, and Bluetooth, 8GB of built-in memory to store pictures and music, a pedometer, and (perhaps most importantly to kids) a handful of children’s apps, some of which can be played over Bluetooth connection with other K3 smartwatch owners. On the safety end, the built-in GPS also comes with the option for children to send out an SOS location alert and a restricted phone contacts list that can be managed by parents. The smart watch is slim and bright, features 320 x 320 pixel screen resolution, and is noticeably lightweight, designed to fit comfortably on young wrists. Reviewers highlight the impressive responsiveness of the watch, comparing it to adult-version smart watches. Others have commented that the 20mm interchangeable colored bands are a nice add-on, allowing children to wear the one that matches their specific style and personality. 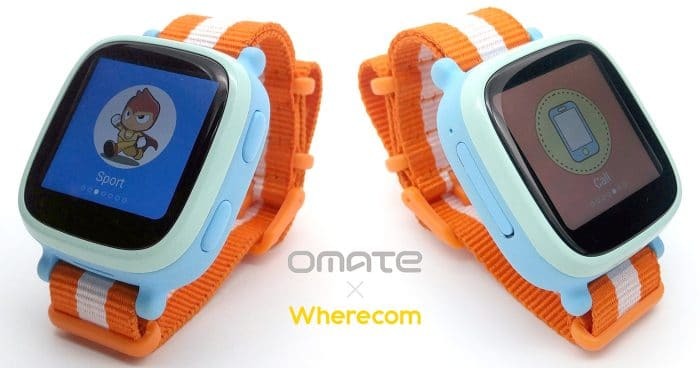 If you’re looking to give your kid a smart watch that is actually comparable to an adult version wearable, the Omnate Wherecom K3 is a clear choice. It’s also a nice toy to give your kids if you want to have a little more control over where they go and who they contact. 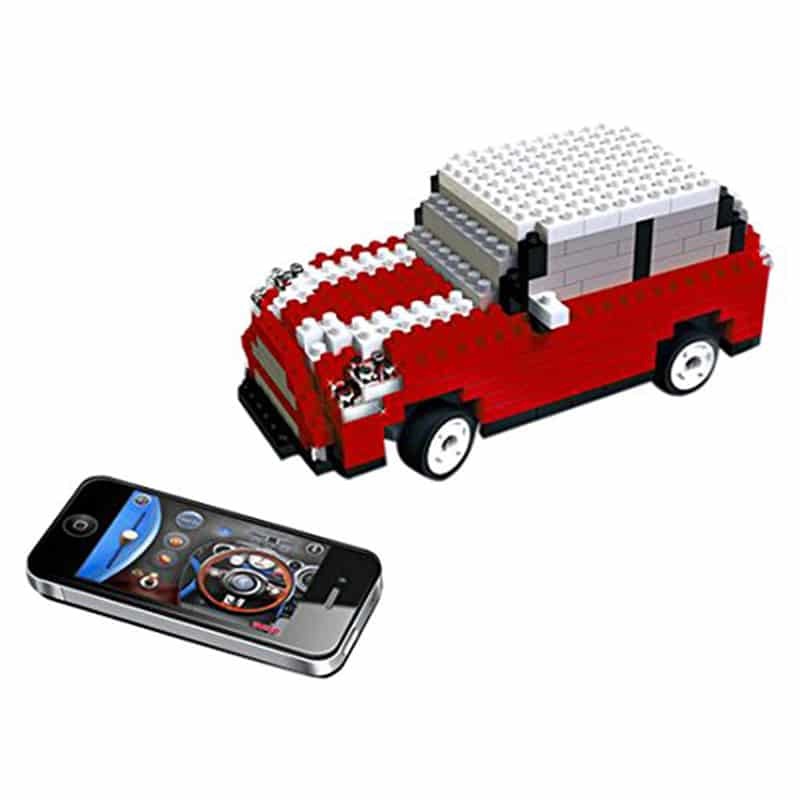 Allow your child to explore the world through the eyes of his or her remote control car. With the adaption of smart mobile devices, remote control toys have come a long way. Once upon a time (not that long ago) remote control devices were simply toys one could move by using, as the name indicates, a remote control. The fun was in being able to operate something from a remote and then follow it around to see where it goes. These days, remote control toys come with more intuitive features that allow your child to more fully interact with their toy and explore their bedroom, toy room, backyard, and more all through the eyes of the controlled toy. The Emperor of Gadgets iConMotor Smartphone Controlled RC Smart Car with Camera has everything your child needs to embrace this new tech-inspired world of remote control toys. The smart toy is more than just a toy car, it’s a miniature race car that is controlled through a smart phone or tablet. Using a phone or tablet as the remote control, your child can control all aspects of driving by connecting with the iConMotor app and using the touchscreen display of the phone or tablet as a control pad. Your child can see as the car sees directly through your smart mobile device, making play time much more engaging. The smart toy even has a built in camera, so you can record footage and take photos when driving around. As this is a toy for children 12 and older it’s not your typical use-straight-out-of-the-box toy and will require a little time to get used to. It’s recommended that children spend about 30 minutes getting used to the control and speed functions when first using the toy. If you child has the driving gene, this smart toy is the perfect way to let them explore driving from a different angle. Because it’s controlled by the screen of smart mobile devices, it’s also an excellent smart toy to help children better develop their hand-eye coordination and motor skills. Give your child an intro to the hottest smart toys for adults with this beginner level drone. Drones are everywhere these days, used in everything from adult backyards for play to delivery for major companies so the usefulness of them cannot be overstated. 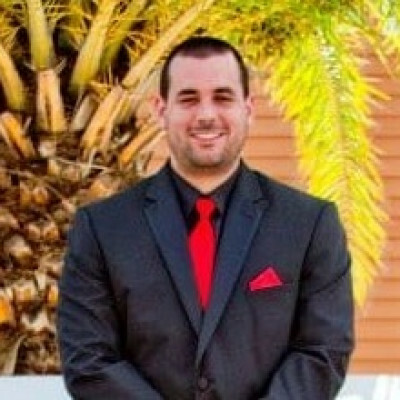 Most drones, however, are created for adult play or commercial use. Instead of giving your child a toy that is really intended for adults, you can equipt them with a drone that is designed with children in mind. 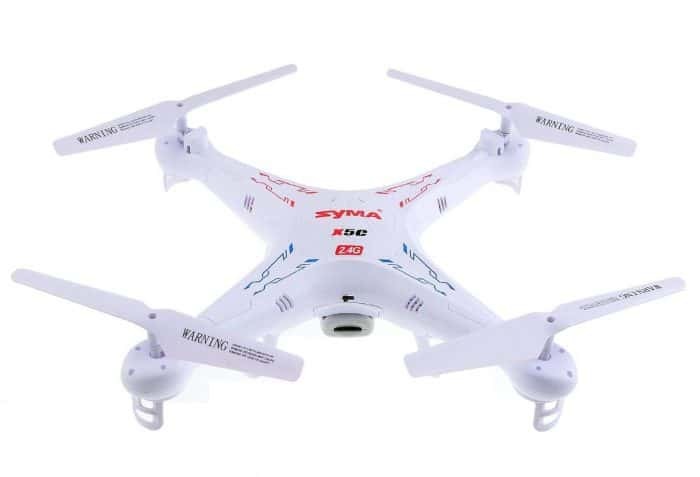 The Syma X5C 2.4G 6 Axis Gyro HD Camera RC Quadcopter with 2.0MP Camera is a number one best seller on Amazon and for good reason: It has everything a child could want in their very own drone. The smart toy can move and do flips at the press of a button with 360 degree vision, is wind resistant, has a built-in HD camera, and can be flown both indoors and outdoors. 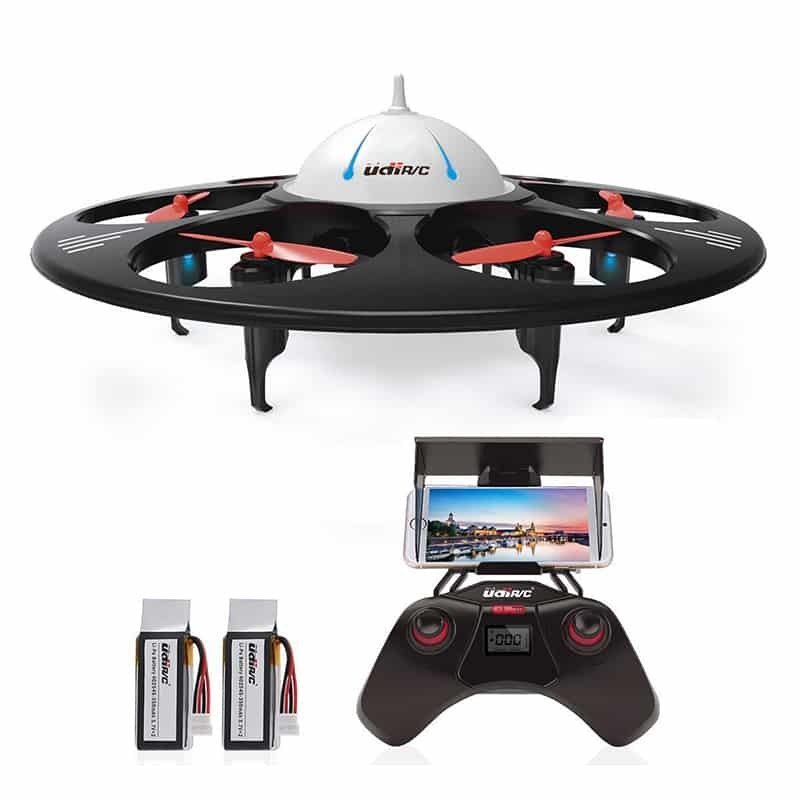 It’s not just a smart toy because of how it’s controlled, it’s also designed smartly, coming equipped with a 6-axis Gyro stabilization system that ensures maximum stability during flight. The 2.4GHz remote control uses spread spectrum technology for further remote distance and anti-interference ability, allowing your child to fly the drone as easily as possible. 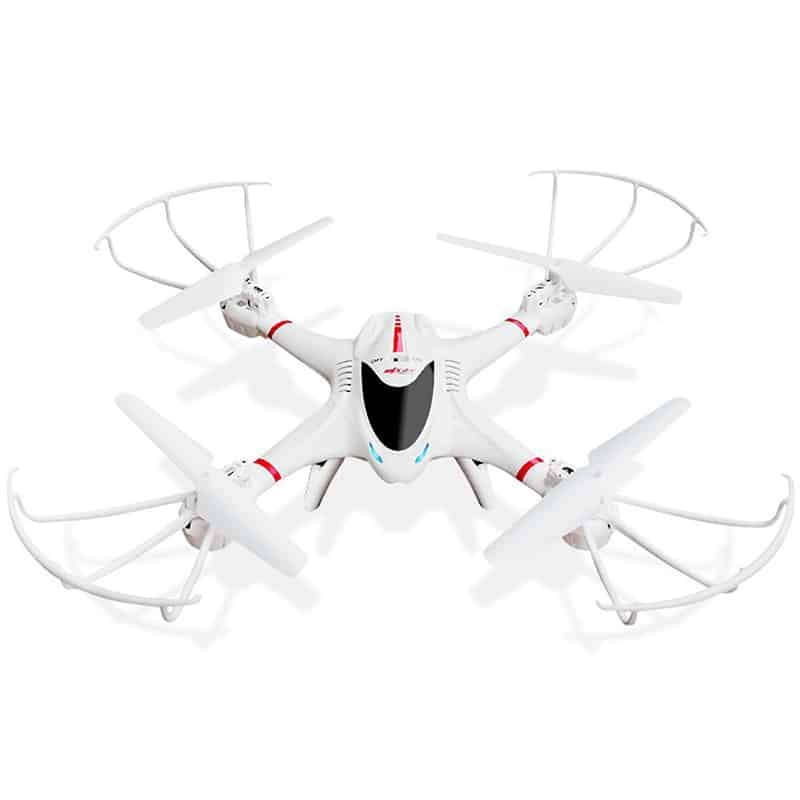 Reviewers state this is one, if not the best drone for the money, stating that it’s durable and does exactly what it claims to. 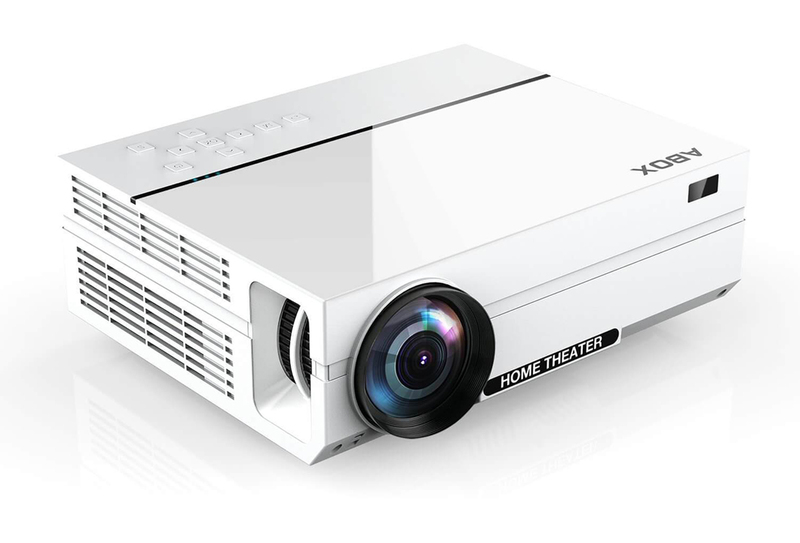 Other reviewers also highlight the photo and video quality of the built-in HD camera, showing and displaying how it captures incredibly crisp, clear photos. If your child loves remote control toys and wants to take it to the next level, the next logical step is to invest in a drone designed with children in mind. This is great for the child who loves to be outdoors and explore the limits of his or her backyard without actually venturing beyond the ground limits. Let this toy teaches your child valuable coding skills and gets them off the couch at the same time. The problem with most smart toys is that some teach your child a skill while keep them sitting still, while others that promote activity and physical fitness aren’t usually able to teach your child at the same time. This typical conundrum is no longer an issue with Hackaball. Started as a Kickstarted project, this coding toy allows your child to learn coding skills while getting them out and about at the same time. The toy promotes conversation and activity, rather than just staring at a screen, and the coding skills it teaches are second to none. 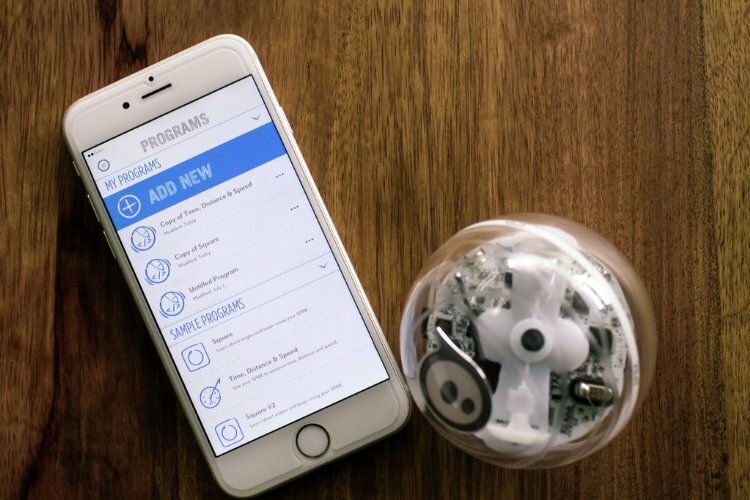 With this smart toy, children can experience first hand all the elements that go into coding, including the steps of planning, building, testing, debugging, and refining, all with instant results. Hackaball basically allows children to throw a computer around as they learn and play. 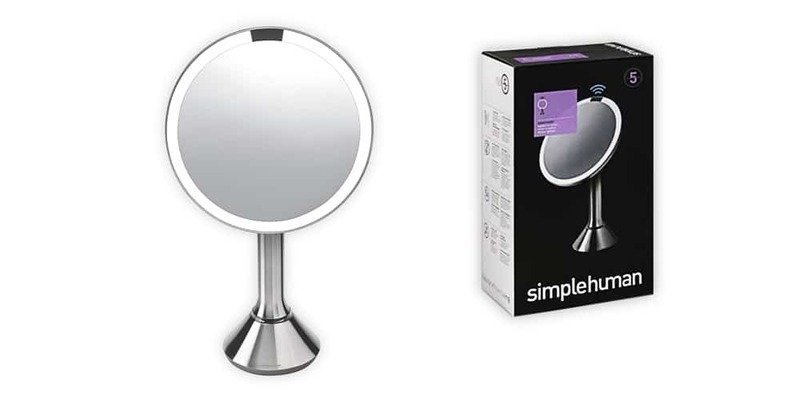 The computer, shaped like a ball with a shock-absorbent housing, comes fully loaded with gyro, accelerometer, a vibration motor, nine LEDs, a rechargeable battery, some memory and a speaker. 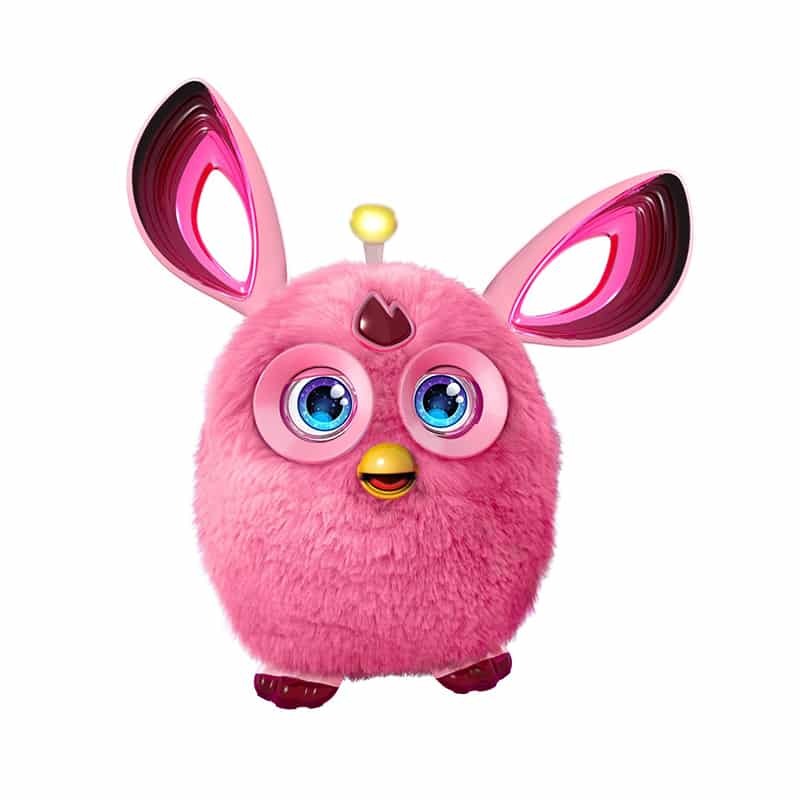 The smart toy can be programmed over Bluetooth using a tablet to create different vibration, lighting displays or an array of sound effects. The smart toy has already won various awards ranging from companies such as Fast Company and TIME to the Design for Experience Awards. 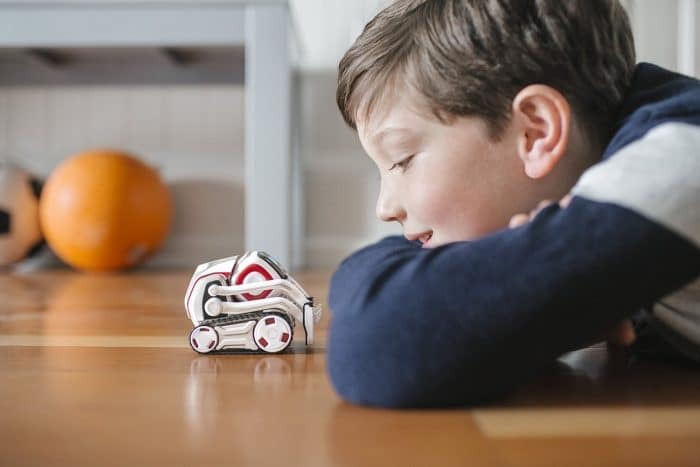 The smart toy is perfect to teach kids who just can’t seem to sit still the basic coding skills they could use in the future. Because the programming is so simple and intuitive, it’s an ideal toy for children who may not even know they want to code yet, but are exploring different interests. Smart toys are available for children of all ages – from baby to teens – and only continue to grow in popularity. These toys aren’t just more fun for children, they also help teach basic skills that traditional toys simply can’t compete with. To give your child the upper hand in life, consider investing in a smart toy that will fuel his or her creative juices, technical skills, social skills, and so much more!